During a farewell service at St. Andrew's Episcopal Church last week, members of the community shared their memories of the historic building with the small congregation. "It was beautiful," Nancy Wiggins Condron, the senior warden, said of the service. "I think the interesting part to me was that the sharing was interactions with people and events – it wasn't about the building, which is really what we're about anyway," said Rev. Steve Uffelman. "We are about people and events and sharing and caring. The structure is a meeting place." The Episcopalians' meeting place is about to change after 71 years. The congregation of 30 members is in the final stages of selling the building to Calvary Chapel of Crook County, a congregation with nearly 300 members. The folks from St. Andrew's are also in the final phases of purchasing a much smaller building, where Pentecostal Faithpoint Ministries was based up until a couple years ago. The vacant building is located at Northeast Seventh and Northeast Elm streets. The change has been a long time coming. "We just don't have the resources. We spend all of our money just taking care of the building and not reaching out in ministry," Uffelman said. "We could continue to stay here, but it feels better for us if there's a larger congregation to be able to have a place where they can all gather and worship together and use this space," Wiggins Condron said, adding that they are only using a fraction of the building. They hope to be able to transition from one building to the other by month end, but if they have a few weeks without a home, both the Lutherans and Presbyterians have invited them to use their facilities for worship services. According to church records, St. Andrew's Episcopal Church traces its origin to the visit of a bishop in 1908. The Right Rev. Bishop Paddock arrived by stage coach and horseback probably twice a year and conducted services in private homes. It was not until the 1930s that priests from Bend were able to schedule monthly meetings. Lack of a home church meant carrying a portable altar and religious accessories to be set up in the Masonic Temple and eventually in the Norman McCarty piano studio. In 1943, the Bishop's Committee selected the name of St. Andrew's for the mission, feeling that Andrew, the hard-working fisherman and chosen disciple, was also a fisher of men and that he best typified the spirit they envisioned for the Prineville church. 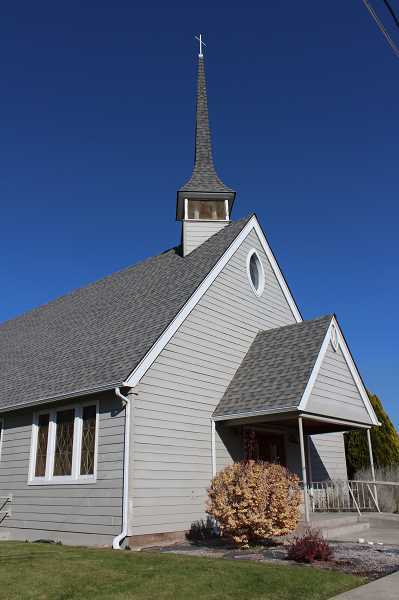 With the advent of the mills, more people moved into Prineville, and the Episcopalian population grew, and with it, the need for a church worker. Rev. E.H. Cook was appointed in 1944 as the first resident pastor, ministering to a membership of 44. During the war years, plans for a church edifice lay dormant, but in late 1945, the Bishop's Committee purchased the three lots where the church now stands. By then, Rev. Leonard Dixon's time was spent in serving the Madras Church and the Prineville congregation. During the fall of 1946, ground was broken for the little chapel at the corner of First and Holly streets. The first baptism and confirmation were held April 27, 1947, in the new building. The church was dedicated on Nov. 20, 1947. By 1950, the Fireplace Room had been added. 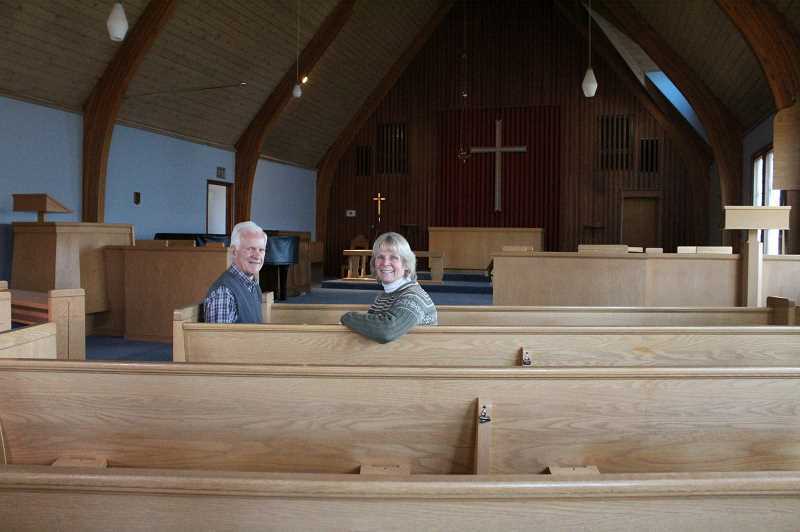 The congregation continued to grow, and by 1958, they had added a new sanctuary and nave to accommodate 150 people as well as three Sunday School classrooms, a kitchen and fellowship room in the basement, a pastor's study, sacristy and office. Over the decades, members included the Breese, Claypool, Shelk, Hodges, Gillis, Grimes and Van Winkle families. In more recent years, the congregation has turned to Mutual Ministry rather than a full-time priest, and they meet in the small chapel. "Larry Ferguson as a priest realized that with the numbers, we just didn't have the financial resources to continue that tradition and that ministry was really the responsibility of every baptized person," Uffelman said, adding that Ferguson was the instigator of developing a mutual ministry approach to ministry in their congregation. "The mutual ministry was putting the responsibility for ministry on all of us to live into our baptismal covenant." Uffelman went through a series of coursework with a seminary in Sewanee, Tennessee, and was ordained into the Diaconate. Currently, Uffelman, Wiggins Condron, Willa Goodfellow and Ray Jeff Sprier take turns preparing and sharing messages during the Sunday morning worship service. 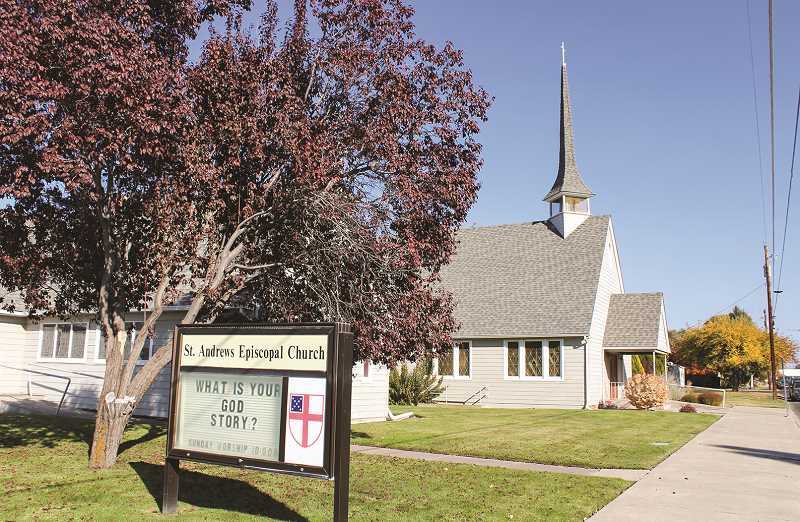 Wiggins Condron's parents moved to Prineville in 1954 and became members of St. Andrew's Episcopal Church. She was born into the congregation in 1957 and has been a lifelong member. "In our walk through the other day, we took a show of hands of who'd been baptized, who'd been confirmed, and who'd been married here," Wiggins Condron said of the farewell service, adding that she raised her hand for all three milestones. When she was growing up, a typical Sunday service drew 75 to 100 members, and there were multiple services. "As a grade schooler, I can remember many people in our Sunday school classes split by age groups, filling the basement," she recalls. But some of her fondest memories of St. Andrew's are the music. "We had choir practice every Wednesday, and there must have been 10 or 15 kids in the choir every Sunday, so we had the benches up there, and we'd practice," she recalls. Gene Southwell, the high school band teacher, and Maury Stone, the high school music director, were both members of St. Andrew's and brought their talents with them. "We used to play guitars with amplifiers and everything," she laughs. "On special occasions, we'd bring in members from the high school band and have big fanfares." The Crooked River Choraliers performed there, and St. Andrew's would occasionally host other community concerts and performances. Uffelman and his wife, Jan, moved to town in 1982 and became members of the church. One of their daughters was married there, and he was ordained as a deacon and into the priesthood at St. Andrew's. Over the decades, St. Andrew's has been a meeting place for a multitude of community organizations. "If you look at the people within the community that have used this building, it's amazing. There used to be a high school mentoring program that met here," Wiggins Condron said of the basement area. "There's been a yoga studio down here." "The school district rented this space for first and second grade at one point because they had too many students at Crooked River," Uffelman said, adding that a private kindergarten was also held in the basement. Over the years, the church has seen Boy Scouts, AA groups, choirs, pinochle clubs, concerts, recitals, weight loss groups and other clubs and organizations use its quarters. It even served as a homeless shelter. The congregation, too, has been supportive of the community, giving to St. Vincent de Paul, Redemption House Ministries, and other community assistance programs. St. Andrew's has hosted the annual Pancake Supper on Shrove Tuesday for as long as Wiggins Condron can remember. "It's the evening before Lent begins, and it's the day to get rid of all the things that you're supposed to get rid of for Lent," Uffelman explained, adding that other terms for it are Fat Tuesday and Mardi Gras. Traditionally, the congregation invites the community to enjoy the Pancake Supper in the church basement. "The old stove, it still works great," Wiggins Condron said of the kitchen's centerpiece. "This is where we cook the pancakes. It's cooked thousands and thousands of pancakes." That stove, however, will not be surrounded by busy Episcopalians this coming Shrove Tuesday — one of the many things Wiggins Condron and Uffelman will miss. Their new facility does not have a kitchen, much less the capacity to host the Pancake Supper. But their new church will be much smaller with much less upkeep, which will allow the members to put their resources into more ministries. The people from St. Andrew's invite anyone who is seeking God to join them. "It doesn't matter who you are or what you are or what your values are. The Episcopal Church in general is not going to judge," Wiggins Condron said. Uffelman said they do their best to be a nonjudgmental, accepting group. "For example, when we hold communion, everybody is welcome. I don't care what denomination or non-denomination, whether you're baptized or not. If you are searching and seeking God, you are welcome," he said. If all goes as planned, Pastor Rory Rodgers and his Calvary Chapel of Crook County will be able to move in by the beginning of the new year. The folks of St. Andrew's are pleased with the new owners and are thankful that their blessed building will continue to be used as a church. "To be able to pass a house of God onto another worshiper of God, it just feels right," Wiggins Condron said.